Preheat to 375.In a medium bowl, toss the chopped apples with a big squeeze of lemon.In a small bowl, mix together the oats, flour, walnuts, brown sugar, cinnamon, cardamom and salt. 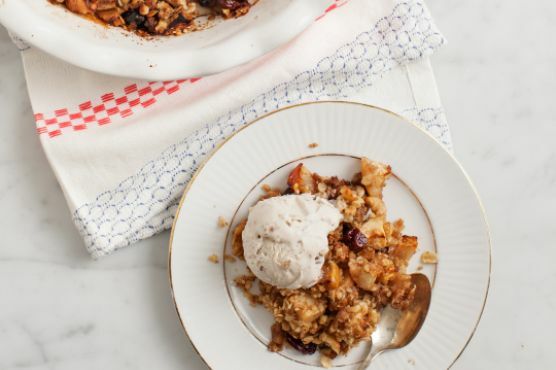 Mix apples and dried tart cherries with 1/2 the crumble and place into a greased baking dish. Sprinkle the rest of the crumble on top. Bake covered for 25 minutes, then uncover and bake 15-20 more minutes until the apples are soft and the crumble is golden brown. Let sit for 15-20 mins before serving. Serve with scoops of ice cream. Crumble can be paired with Cream Sherry, Moscato d'Asti, and Port. A common wine pairing rule is to make sure your wine is sweeter than your food. Delicate desserts go well with Moscato d'Asti, nutty desserts with cream sherry, and caramel or chocolate desserts pair well with port.